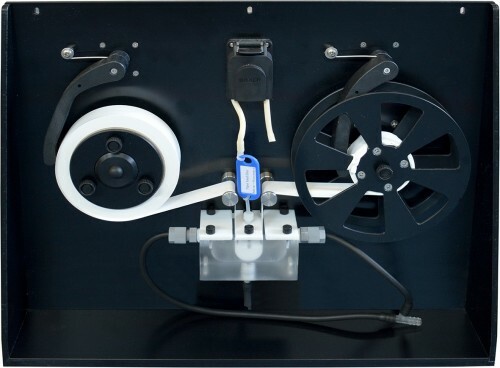 The SP2000 analyzer holds 1 rack with 30 bottles for the original water samples, 1 rack with 30 empty bottles for filtered water samples and various destination racks with empty vials and tubes. 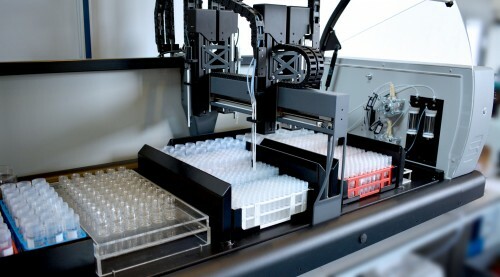 The robot is configured with various stirrers, dispensers, pipetting needles, pH probe, conductivity flow cell and paperband filter. The sample rack and destination racks are loaded onto the SP2000 platform. A sample analysis table is created and the analyzer is started. The first sample is homogenized and then pumped through a paper band filter for sample filtration. After filtration, the sample is pumped, via a flow cell to measure the conductivity, in an empty bottle. When all samples have been filtered and measured for EC, the pH is measured in every bottle. The filtered samples are distributed over several destination vials/tubes and if required additional reagent is added to preserve the samples. The samples are now ready for further analysis. It is possible to combine the above application with Alkalinity and Chloride titration.